In this series, you will learn how to create modern web applications with Python, Flask, and Angular. TL;DR: In this series, you will learn how to create modern web applications with Python, Flask, and Angular. You will use this stack to build a SPA and a backend API to expose exams and questions so users can test their knowledge regarding different technologies. In this GitHub repository, you can find the final code created throughout the second part of the series. Part 1 includes topics like bootstrapping the Flask application, managing Entities with SQLAlchemy ORM, and bootstrapping the Angular application. Part 2 (this one) includes topics like securing Flask Apps, handling Angular forms, and securing Angular Apps. Part 3 includes topics like configuring Angular Material, handling Authorization, and migrating Databases with Alembic. In this series, you will use Python, Flask, and Angular to build a web application based on a modern architecture. With Angular, you will build a SPA (Single Page App) that allows users to browse through exams and questions. These users, when authenticated, will be able to test their knowledge regarding a specific topic by choosing one of the multiple choices that a question exposes. Then, when your users submit their answers, your backend will check if they are right or wrong, record the result, and send back this result to users. In this part of the series, you will start by configuring Auth0 as the identity management system of your app. You will configure an Auth0 API to represent and secure your Flask application and you will configure an Auth0 Application to represent and secure your Angular SPA. After securing your app with Auth0, you are going to enhance the application to allow users to test their knowledge. "I'm building modern webapps with Angular, Flask, and Python!" Instead of investing time to develop rudimentary authentication mechanisms to manage the identity of your users, you are going to use Auth0. For startup projects like this one, the free tier provided by Auth0 is more than enough. Besides being free, by choosing Auth0, you will get a modern, easy to use, and reliable service capable of integrating with tons of different social identity providers (e.g. Facebook, Google, Twitter, etc). Also, if you ever need to integrate with enterprise identity providers using protocols like OpenID Connect, SAML, and WS-Federation, don't worry, Auth0's got you covered. That is, Auth0 can help you focus on what matters the most to you, the special features of your product. In addition, Auth0 can improve your product's security with state-of-the-art features like passwordless, breached password surveillance, and multifactor authentication. Name: This is a friendly name to remind you what this API is about. Here, you can enter something like "Online Exam". Identifier: This is the logical identifier (a.k.a. audience) of your API. Usually, developers use an URL to represent their APIs. Although this is not mandatory, it is a good approach. So, in this field, enter something like https://online-exam.digituz.com.br. Signing Algorithm: In this field, you will have to select between two strategies: RS256 (the default one) and HS256. The best option is to stick with the default one (RS256). If you are curious, you can check this thread to understand the difference between them. When you finish filling out this form, you can hit the Create button. This will redirect you to a tab called Quick Start inside your new Auth0 API. From there, select the Scopes tab and add a new scope called manage:exams (as a good practice, always define scopes when dealing with the OAuth 2.0 authorization mechanism). You can add a simple description like Manage exams to it. After that, you can leave this page open and head back to your Flask project (i.e. to the backend directory inside the project root). First, it defines three constants: AUTH0_DOMAIN, ALGORITHMS, and API_AUDIENCE. Your project will use these constants to communicate with Auth0 to validate users (tokens). Note that you will have to replace the value of these constants with the details of your Auth0 account. Second, it defines a class called AuthError. This class exists to represent errors originated in this module. Third, it defines a function called get_token_auth_header. Your app will use this function to read Authorization headers to fetch their access tokens. Lastly, this module defines the requires_auth decorator. This decorator might look complex but, if you analyze carefully, you will see that all it does is to fetch the correct public key from Auth0 to validate tokens. Instead of sharing static public keys, Auth0 uses the JWK specification to represent the cryptographic keys used for signing tokens. You can learn more about this subject here. Note that you are securing only the add_exam function (i.e. the endpoint that accepts POST requests). The endpoint that retrieves exams will remain public so visitors can see what exams your application contains. Another important feature added by the new version of this file is the handle_auth_error function. By using the @app.errorhandler decorator, you are configuring your Flask application to call this function when AuthErrors are raised. This error handler makes errors look nice and easier to fix as they simply return a JSON object with the details. "description": "Tricky questions about TypeScript." git add . && git commit -m "securing Flask with Auth0"
Next, you can go back to your code. Before integrating Auth0 into your Angular app, you will add two new components to it: ExamsComponent and ExamFormComponent. The first one will render the list of exams (i.e. you will remove this functionality from the AppComponent) and the second one will allow authenticated users to create exams. As you can see, this component exists only to show a title and to define where other components will be rendered (<router-outlet></router-outlet>). As you have moved this component's template to this file, you can remove the app.component.html file. There is nothing fancy about this component, you are simply moving the code that renders the list of exams from the AppComponent to this one and adding a button to enable users to navigate to the /new-exam page. 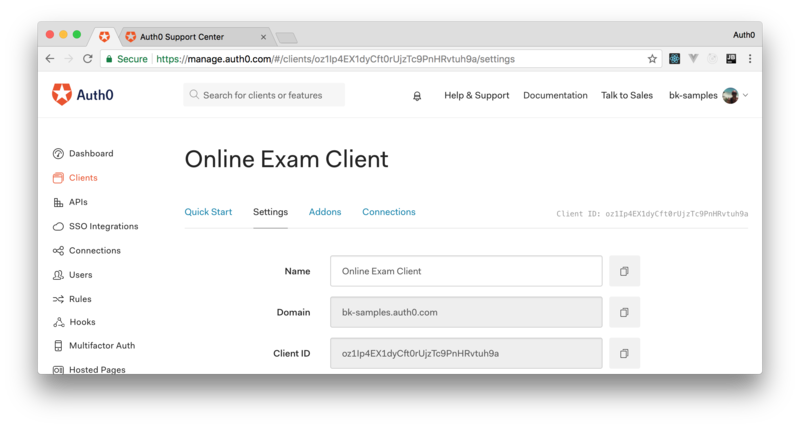 In this component, you are defining two input elements where users will be able to inform the title and description of the exam that they are creating and a button that triggers the saveExam method. This method calls another (homonymous) method that you will define in the examsApi service. Then, if the call to this method is successful, users are redirected to the home page (/) and, if the call is unsuccessful, an alert is shown by the browser. With these changes in place, you can open a terminal, move to the frontend directory, and run the ng serve command. Then, if you open http://localhost:4200/ in a browser, you will see the list of exams and a button labeled New Exam. Clicking on this button, you will be redirected to your new form. The problem now is that you will get an error saying "Http failure response for http://localhost:5000/exams: 401 UNAUTHORIZED" when clicking on the Save Exam button. The reason for that is simple, you haven't configured Auth0 in your Angular app yet. Name: Another friendly reminder, this time to your Auth0 Application. Here, you can add something like "Online Exam Application". Application Type: The type of the application that you are creating. In this case, as you are using Angular to create a SPA, you will choose Single Page Web Applications. Having filled out this form, click on the Create button. When finished creating your application (it takes just a second or two), Auth0 will redirect you to the Quick Start tab of the new application. From there, click on the Settings tab to inform to Auth0 what the Allowed Callback URLs are. As for the moment you are only running your app locally, you can simply add the http://localhost:4200/callback URL to this field. Now, you can hit the Save Changes button at the bottom of the page and leave it open (you will need to copy some properties from it soon). Note: You have to use version 1.7.0 of this library as the latest version (2.X) includes breaking changes. As you can see, this component simply shows a message saying "Loading authentication details..." to users and delegates to auth0-web the process of parsing the callback URL. Then, when auth0-web finishes its job, users are redirected to the home page (self.router.navigate(['/'])). In the new version of this component, you are adding two new buttons (Sign In and Sign Out) and a paragraph that shows names of authenticated users. All these new elements are conditionally showed according to the authenticated flag. The Sign Out and New Exam buttons are visible when this flag is set, otherwise you'll see the Sign In button. To make everything work, the new ExamsComponent references and calls three methods provided by auth0-web (signIn, signOut, and getProfile). Besides these methods, this component also subscribes an anonymous function to change the value of the authenticated flag whenever the authentication status changes. The difference to the previous version is that now you are adding the Authorization header to the POST request that is sent when users try to save a new exam. This header is the missing piece to make your Angular and your Flask apps communicate properly. Note that you will have to replace the domain, audience, and clientID properties on this code with values from your Auth0 account. So, head back to your Auth0 management dashboard and copy the domain and clientID from the Auth0 Application created before and audience from the Auth0 API (that is, copy the API identifier and paste it here). That's it! 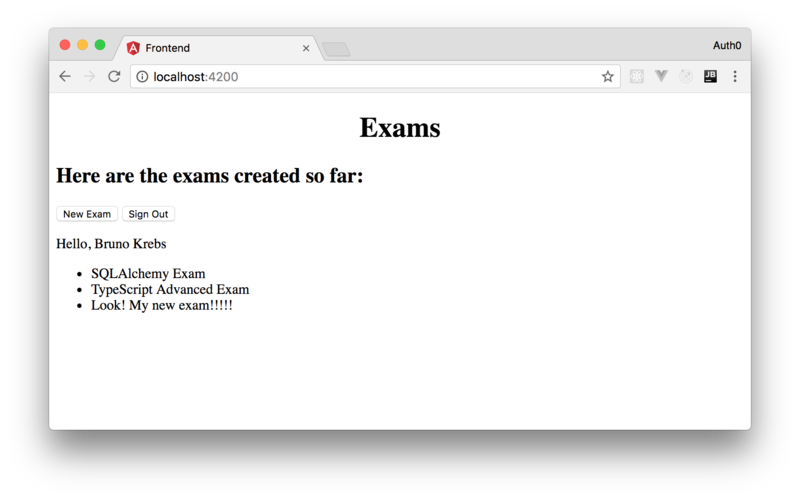 If you run your Angular application now, you will be able to create new exams. Wait! Don't forget to save your progress!! git commit -m "Integrating Angular with Auth0"
"Securing applications with Auth0 is easy and allows me to focus on my apps features." In the second part of this series, you focused on adding Auth0 to act as the identity management service of your Flask and Angular applications. You started by defining an Auth0 API to represent your Flask backend app, then you added a new feature into your project (a form that allows users to add exams), and, finally, you integrated Auth0 into your Angular application. In the next article, you are going to learn how to install and configure Angular Material components, how to use Auth0 roles to control what users can do, and how to use Alembic (a database migration tool) to manage your database schema.